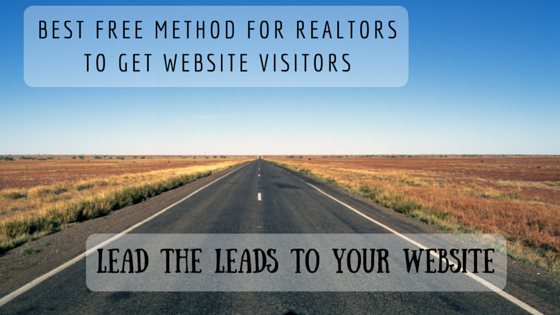 The best free way to get leads to your website is… Your Blog. Virtually every Realtor have been told the importance of writing a blog. Some Realtors have good intentions about starting a blog. Very few real estate agents have a blog. Even fewer do a good job maintaining it by regularly posting quality content. We’re not making that up. According to the National Association of Realtors 2015 Real Estate in the Digital Age report, only 12% of Realtors have a blog. And another 12% of Realtors don’t have a blog, but plan to. The remaining 76% of Realtors apparently just won’t blog. A blog is a form of marketing. More specifically, a blog is one form of content marketing. In English, or in Realtor-speak, that means making valuable information available to your clients and leads that is relevant to you and your business. For Realtors, that information can be shared through videos, by social media, with direct mail letters, and by a blog. Every real estate agent should have their own website. A Realtor is basically a small business. And small businesses need websites to show their customers and potential customers what they do, what they will do to serve the customer, provide people with a way to contact the business, and to be a marketing tool for that business. All of that is really easy. The challenge becomes getting people to the website. Without a blog, the people who go to a real estate agent’s website are people who are already in the Realtor’s database. The Realtor’s database knows about the website because the website address is on the Realtor’s business cards, their letterheads, their email signatures, their social media accounts, and anything else the Realtor uses to communicate with their database of clients and leads. Don’t get me wrong, getting your existing database to visit your website is very important. It’s important for your database to get the utility of the IDX to search for homes, whether they’re interested right now or whether they’re snooping to find information about their neighbor’s house that just went on the market. The website also makes it easy for your database to refer you to their friends. What about all the people not in your database? All of those potential leads. All of those people who you know you could convince to be your client if they only gave you the opportunity to talk to them. The reality is that without a blog, most people won’t know you have a website. They probably don’t even know you exist. But they are on the internet searching for things that are home related, moving related, community related, buying process related, real estate market related, real estate agent related, and countless other things. Think about the questions your clients ask you – there are people who don’t have a real estate agent to ask that are Googling that information right now. That information that those Googlers need is right in your wheelhouse of expertise. Content marketing will drive leads to your website. Not on Day 1, but over time content marketing will prove to be an important generation of website traffic for new leads. Out of all the methods of content marketing, a blog is the easiest, cheapest, and most common way to outbound market a Realtor’s business. Write a articles that contain information that your audience would find valuable and post to your website regularly. After posting to your blog regularly for several months, Google and other search engines will begin to determine that your website is an authority on local information and real estate. Then when people search Google, or other search engines, for information that you have written about, your website will show up on the search engine results page (SERP). People will click on the link to your blog post, and stay on your website because of all the amazing value that it provides. These are people who aren’t in your database. These are potential leads. If they like the content that you have written about, your website provides them utility (like IDX), and they resonate with your brand, then they will very likely give you their information and become a lead that wants to talk to you. And the opportunity is amazing. 92% of home shoppers use the internet as part of their home search. However, as we mentioned earlier, only 12% of Realtors have a blog, according to the NAR. Out of those 12%, how many do you think really write regularly, or write about topics as well as you could? More important, how many Realtors in your market blog regularly? The opportunity for a real estate agent to succeed using content marketing in the form of a blog is unprecedented. It’s like saying 92% of home shoppers get their coffee at Starbucks every morning, but only 12% of Realtors go to Starbucks with their business cards to talk to people in line. Another way to think of this statistic is that 88% of Realtors don’t have a blog. Wouldn’t it be nice to generate leads in a proven way that 88% of Realtors aren’t even attempting? Blogging takes effort. If it were easy, everyone would be doing it. However, the few Realtors that are blogging, and blogging well, are generating a tremendous amount of business from their website. Blogging takes time. Most real estate agents have very little spare time. So finding the time to write a blog is challenging. However, blogging will likely prove more effective than other forms of marketing that take time and money. Blogging is free. All forms of content marketing can be free. The only thing a Realtor needs in order to blog is a website. What else in life is free, but provides such income potential? Most website services will provide a blog page as part of the website they deliver. Even if you decide not to write blog immediately, it is important to ensure that you have a website that allows you to post a blog. Interested in starting your own blog? Agent Sidekick can help get you started with a website to start generating leads. Feel free to take a Product Tour or Contact Us today to learn how! You know how to run your real estate business. We can be your sidekick. Agent Sidekick is here to support you by providing website, branding, and other services so you can focus on your job of being a real estate superhero! You can read more on our About Us page. Hi! I'm Mike. I am a marketer and website builder. The service we provide to you is with the home shopper and seller in mind. Your website and all of the tools that come with Agent Sidekick's service will help you and your clients succeed.